My business partner and I are building a mobile and web social casino with really high production values. The casino games are secure, server based, with IAP, following best practices that I have picked up over the years of developing actual AWP and SWP games (both club and non-club editions) in Europe and later building a secure web based social casino in 1996 for VirtualVegas.com (now long dead) that was eventually sold to Vivendi Universal for somewhere north of $240M. I’ve done about forty AWP/SWP machines, including a couple of pari-mutuel wager based games, and well over fifty desktop/web based casino games that you can find in various “20 slot machines!” game boxes for $20 at Staples and Target that were created many years ago. A link to the late-alpha/early-beta build of the mobile version exported for web play: http://www.otakunozoku.com/lucky-ace-slots-my-next-ios-game/ (requires Unity web player plugin at this time). We still have some features to implement in this game before it is ready, e.g. display visible pay lines, progressive jackpot, free spins, and lots of animated bling of course. The machine model I’ve built is very rigorous and follows best practices with separation of concerns and clear demarcation of client and server responsibilities. It is a technical achievement I am actually quite proud of because I envision the underlying engine, technology stack and visual client powering a line of gaming products for at least the next decade. 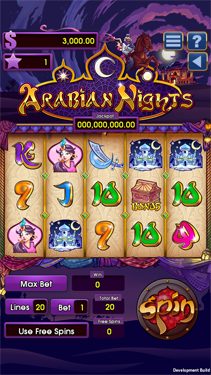 The slot machine game engine has been built to be completely configurable with as many reels, symbols, pay lines, payouts, bonus games and extra features, e.g. free spin, progressive, ladders, high lows and a bunch of other features that can be tweaked endlessly. Next phase of development once we launch is to take the proprietary tools in to a HTML5 web based slot machine construction kit (S.M.A.C.K.) that can be used to construct lots of new machines beyond the four themes we have built so far. This is a version built specifically for demo purposes, the actual version in development has all of the social aspects enabled, IAP, bonus game, and so forth but its not yet ready for primetime. We also have a bingo game that has just hit beta along with video poker, blackjack, poker, roulette and a word game at alpha stages of development as well, all of them single player and multiplayer configurations with various mathematical models behind them. We’re open to licensing deals and investment opportunities. Let me know your thoughts and if you have any specific questions about the implementation. I’d be happy to answer them.